Democratic Senate candidate Elizabeth Warren is under increasing criticism over her listing herself as a Native American as a law professor — a status reported by Harvard Law School in counting her as a minority faculty member. There is limited evidence that Warren is indeed Native American. At most, the degree of indian blood is extremely low. Warren has answered the criticism by saying that she was not trying to use minority status for her own professional benefit but to establish personal associations. The controversy has caused a buzz among law professors as to the definition of minority status for professors and students alike. Warren is a very talented academic and I do not share the view that she was given her position at Harvard (or received her well-deserved praise as an academic) due to the claim of being a minority. There is a mixed record on the question of her great great great grandmother. The article below says that genealogists at the New England Historic Genealogical Society were unable to support claims that her great great great grandmother is Cherokee. O.C. Sarah Smith is listed on an electronic transcript of a 1894 marriage application as Cherokee but they have been unable to find the original record. However, it would seem to be that the electronic record should give Warren the benefit of the doubt as to her beliefs in her ancestry. That does not entirely answer the question, however. Even if true, such a connection would constitute a reported 1/32 part Native American. Many Americans have such a small connection to Native Americans. Is it relevant to running for political office if voters believe that Warren wrongly claimed or exaggerated minority status? I see no reason why someone should not claim ancestry tied to Native Americans, no matter how tangential. While I expect that there are a couple dozen of other bloodlines and cultures in the Warren family with equal or greater presence, it is clearly something that the family took pride in as part of its history. Putting aside the hyper partisanship that seems to warp all analysis these days, there remains some difficult questions for the legal academy. While I do not believe that Warren’s well-earned success was due to this claim, she did make the claim for years and being a minority law professor does work to the advantage of both the academic and the school as institutions work to increase their minority numbers of both students and professors. The controversy also highlights the uncertain standards for claims of minority status among law schools. We are currently in the midst of a scandal over inflated employment numbers and the effort to impose concrete standards for how to count employment. Do we need the same reexamination of the claim of minority status or should it be entirely self-defined for each academic? were trying to make a big deal out of Democratic Senate candidate Elizabeth Warren’s past self-identification (and once, her identification by Harvard Law School) as a “Native American.” It mainly caught my attention because, like Warren (and for that matter, like many white people I’ve known from North Georgia or Oklahoma), I have a Cherokee ancestor, a great-great-grandmother as it happpens, though I’ve never self-identified myself that way. Then I ran across a Boston Herald (the original source of the whole story) column by a certain Howie Carr that shows exactly how ugly and overtly racial this attack-line has become. It’s not, in fact, really about Elizabeth Warren, but about an increasingly aggressive effort on the Right to invent a nightmare-world where incompetent women and minorities are lording it over the poor afflicted white male. 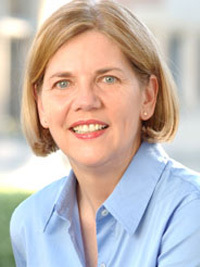 Keep in mind that there is not a shred of evidence that Warren ever benefitted in any way from her self-identification; indeed, every university who’s hired her in the course of her very distinguished academic career has indicated they weren’t even aware of it, and certainly didn’t make it a factor in employing her. That doesn’t deter Carr from asserting that “Pocohantas” Warren “parlayed the racial-spoils racket all the way to a tenured position at Harvard Law,” or that her case “shows just how morally and intellectually bankrupt ‘affirmative action’ is.” For good measure, he lurches into an equally unsubstantiated claim that President Obama got a “free pass to Columbia and Harvard Law” because of his race. Look, I can understand how people can legitimately question this or that aspect of academic affirmative action policies, but this seething hatred against any woman or minority member who has won a measure of success in a system where white men still massively, overwhelmingly run the country is just bizarre. Anyone looking at Barack Obama or Elizabeth Warren and immediately seeing the beneficiary of a “spoils racket” is just deranged beyond redemption—or perhaps, in Carr’s case, just cynical beyond belief. No wonder Sen. Scott Brown (R-MA) is working so hard to distract Massachusetts voters with non-issues. That’s so they don’t pay attention to just how much he is owned by Wall Street. US Senator Scott Brown, who played a critical role in the battle over the 2010 financial regulatory overhaul, has used a joint fund-raising committee to collect $2.9 million in political donations over the last year, nearly half of which came from the nation’s financial sector. The mechanism is a joint committee, the Scott Brown Victory Committee, between Brown and the National Republican Senatorial Committee. Campaign finance laws allow this kind of committee much higher donation limits than traditional campaign committees, $30,800 per donor per election cycle versus the $5,000 limit for regular committees. Brown delivered for Wall Street in the battle over Dodd-Frank when he extracted a pro-industry concession from the Democratic majority: the elimination from the bill of a proposed $19 billion tax on banks, money which would have been used for part of the regulatory overhaul. He also championed a provision that curbed restrictions on certain investment activities by banks and insurance companies. BOSTON — A Harvard Law School professor and former Reagan administration official is calling “false” and “complete nonsense” any suggestion that Elizabeth Warren enjoyed an affirmative action advantage in her hiring as a full professor. Harvard Law School professor Charles Fried, who served as U.S. Solicitor General under President Reagan, said the Democratic Senate candidate was recruited to be a tenured professor because she was preeminent in the fields of bankruptcy and commercial law. Fried, a member of the appointments committee that reviewed Warren, said the subject of her Native American ancestry was never mentioned. State Republican Party Chairman Bob Maginn had asked Harvard to review Warren’s hiring. BOSTON — U.S. Sen. Scott Brown is calling on his Democratic challenger Elizabeth Warren to authorize the release of her law school applications and all personnel files from the universities where she has taught. The Massachusetts Republican said Tuesday that serious questions have been raised about Warren’s claims to Native American ancestry and whether it was appropriate for her to assume minority status as a college professor. Harvard Law School professor Charles Fried said Monday that any suggestion that Warren enjoyed an affirmative action advantage in her hiring as a full professor is “false” and that Warren was recruited because of her expertise in bankruptcy and commercial law. Many Native Americans are angry at the GOP assault on Elizabeth Warren for, Republicans claim, misusing her ancestry to advance her career. Last month, the Boston Herald reported that Harvard Law School had listed Warren, the presumed Democratic candidate for Senator in Massachusetts, as a minority professor to deflect criticism that it lacked diverse faculty. Sitting Senator Scott Brown’s campaign and right-wing media have not let up, even though it has since been reported that Warren definitely is one 32nd Cherokee. Warren told reporters on May 2 that she listed herself as a minority in Harvard’s directory in order to connect with others like her, “people for whom ‘Native American’ is part of their heritage and part of their hearts. There aren’t a lot of people like me in law teaching. And so I just thought I might find some others. That’s evidently not a particularly good use for the directory because it never happened.” That’s why, she says, that she stopped calling herself a minority in the directories after having done so for almost a decade. Warren says she was qualified for her position, and the Native aspect didn’t play a role in her hiring, which has been backed up by the Harvard officials who hired her. “I think this is simply a cynical ploy by right-wing propagandists trying to find a piece of mud that sticks against Warren,” she says. Akers believes Republican politicians sometimes use racial issues to divide voters and to play on their insecurities. In this case, she says that the Brown campaign is trying to make it seem like a white person may have lost out on a position due to Warren’s situation. “The mainstream media definitely has added to this controversy due to their well-known ignorance about tribal citizenship and other tribal issues,” says Julia Good Fox, a professor at Haskell Indian Nations University. Good Fox notes that the media has largely failed to explain tribal citizenry and blood quantum issues to give context to the situation because these aren’t easy stories to tell. It’s easier to label the case ‘convoluted,’ blame Warren, and move on to the next political gotcha story. “Unfortunately, for the most part, their coverage is just adding to the confusion and threatens to feed racism or anti-Indianism,” Good Fox says. To do better, she says the media should start by noting that tribal nations have a right to determine who their citizens are, rather than focusing on the misunderstood notion that tribal citizens can only be determined by U.S.-imposed mathematical fractions. Writing for Politico, Sarah Burris, an Oklahoman like Warren, points out that the current chief of the Cherokee Tribe also is 1/32 Cherokee. “Conservative commentators scoffed all last week at what they assert is Warren’s low percentage of native ancestry. Their problem — like most people who didn’t grow up in a place like Oklahoma — is they have no real frame of reference for how much blood is removed with each generation,” writes Burris. Thanks for the update, Elaine. BOSTON — Records show that the leading Democratic candidate for U.S. Senate in Massachusetts identified her race as “white” on an employment record at the University of Texas and declined to apply for admission to Rutgers Law School under a program for minority students. The records on Elizabeth Warren were obtained by The Associated Press on Thursday. Warren’s heritage has been under scrutiny after it surfaced that she had listed herself as having Native American heritage in law school directories. Warren’s campaign said the records reinforce her earlier statements that she never relied on a claim of minority status to get teaching jobs. She has criticized the campaign of Republican U.S. Sen. Scott Brown for suggesting that might be the case. In the Republican Nirvana, nobody helps nobody, and they refer you to Thomas Sowell. Or Ayn Rand. And then go back to counting their money with a clear conscience. @Dagmar: I wish all applications were numbered and vetted by an independent party to ensure anonymity of family, gender, race, age, disability, nationality, religion, and any other physical or social characteristic that is not correlated with academic performance. And if that makes too many at the top equivalent, have them take another test! (Harvard, for example, typically receives more applications from high school valedictorians than it has freshman slots available, and I think being your high school valedictorian is a valid academic criterion to consider). My wife is 1/8th Cherokee, and has never claimed native American status on any job applications, or anywhere else, and that would make our two sons 1/16th. The also have never attempted to use native American status for anything, but maybe they should. @Bron: Sowell is right about the mechanics of this thing, specifically regarding Self Preservation for organizations. But some of his diatribe is slanted, and ignores routes to success that are plausible. It is true that most people do not want to lose their jobs, so organizations like the March of Dimes, instigated by Polio, did not disband upon the defeat of Polio. They adapted and looked for other causes to drive them, and who is to say an organization cannot find honorable and good reasons to continue its existence? From an efficiency standpoint, why should the waste the infrastructure and working intelligence of their organization? They banded together to do one good thing, they have a victory, why not continue to do good things? From the standpoint of reparations, I was speaking in the literal sense of “repairing damages,” not giving every black person ten thousand dollars or whatever. I find that concept ridiculous. However, on the other hand, Sowell’s point can be taken: Where there is money to be had there will be sociopaths competing for the money, and that is true of charitable (and religious) organizations in spades, because they are largely unaccountable to anybody about how their money is spent and what benefits the leaders of the organization can derive from that spending. I believe the correct approach is information-heavy. The damages done by slavery and discrimination (against blacks or women or any other repressed group) that needs to be repaired is lost opportunity; the economic effect of repression is to control the limited resources of opportunity, to deny opportunity to one group and reserve it exclusively for their preferred groups. For example, whites, or males. This means we can repair the damages of repression by addressing disparities in opportunity, which are easier to find and prove than discrimination. It is true that a large chunk of documentable disparities in opportunity may not be due to discrimination, but so what? If they are due to the poor choices of somebody’s parents (like drug addiction, or gambling or drinking problems), what is wrong with helping the kids of those parents to achieve their potential? If the problems trace to parents that could not earn money due to physical or mental illness or disability, what is wrong with helping the kids of those parents achieve their potential? The solution is to classify the TYPES of disadvantages the repression could cause, and when we can document that a particular person suffered that TYPE of repression, regardless of their physical characteristics, we help them get over it. As time goes by, the number of qualifying people will naturally diminish, and the number of government employees necessary to oversee the process will diminish too. But government need not suffer from the “self preservation” trap of Sowell. It is large enough that the employees can be reabsorbed into other duties, and attrition is significant enough to shrink the overall ranks of government pretty quickly. Direct reparations is a simpleton shotgun approach that depends upon a correlation between skin color and the effects of slavery and official repression that are ever shrinking. The intelligent approach is to try to minimize the secondary effects, of poor education, poor nutrition, poor safety, and diminished opportunity. When it comes to university acceptance, I do not even believe in preferences for THOSE conditions (or other preexisting conditions, like wealth). I believe in a meritocracy, the highest test scores win. However, I do believe that society should pay for remedial education, if somebody wants it. If they have the potential to win a spot in the university of their choice, and they are willing to put in the time and effort, we should help them in their attempt to become skilled enough to achieve that. I believe those investments would be better for society as a whole, the more people we rescue from low-wage laborer existence to become educated professionals, the more productive we are and the happier we are. The less desperation we have, the less crime and drug addiction we have, the less welfare we need, the less police force we need, the fewer prisons we need. We even need less medicine and emergency room care, because people that earn more engage in more preventative care that saves money, and are more likely to visit a doctor and catch a cancer or other illness early enough to be treated. That is WHY those are investments, the cost to society of NOT giving everybody the chance to reach their potential is poverty, and the price we pay for poverty, in our taxes and insurance and health-care and in our losses of life and property due to crime, far outweigh the cost of simple nutrition, education, shelter and safety in the streets. I believe Thomas Sowell is an astute observer.